What's in my Shopping Cart is a way for you to peek inside my grocery shopping experience. My first published post in this series can be found HERE. 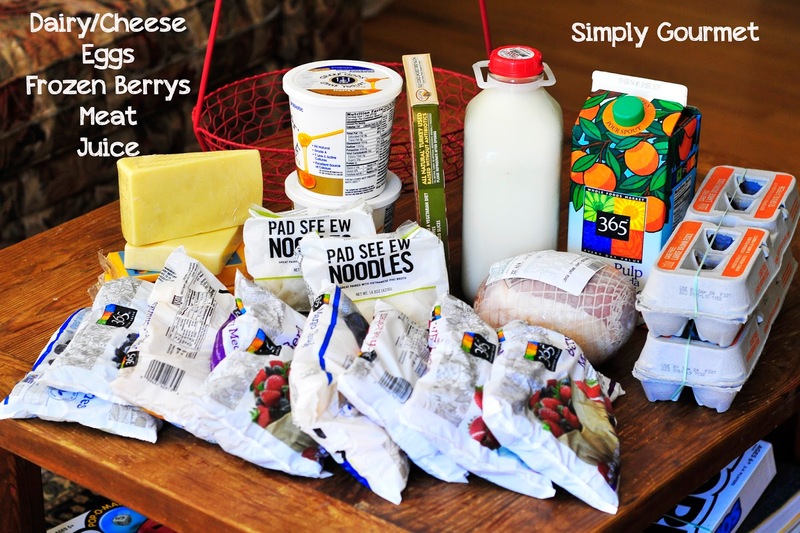 My final bill for this shopping trip: $242.00 I have offered a few suggestions at the end of this post of how I cut corners when grocer shopping. You may notice that it was a bit less than my projected $300 dollars that I normally budget. The reason is we bought only two meat items. I mentioned in my earlier post that we don't eat a lot of meat. The meat that I bought at the beginning of the month has lasted us into this shopping excursion. I spent the extra money that I saved on a few bulk items from Amazon: honey, maple syrup, gluten free soy sauce and a new Immersion Blender for the kitchen. My hand mixer died. These things are not pictured. If we don't eat a lot of meat then what do we eat? Let me use the picture above to help you understand where the "main dish" would come from for our dinners in the form of vegetable dishes. Spaghetti Squash--We love squash and this is a great way to use up our tomatoes from the garden and make a fresh tomato sauce to serve over the "noodles". In addition to this I would serve rice for the kids (starch) along with a bowl of pitted cherries. Portobella Mushrooms--I am in love with these. I add some olive oil, salt, pepper, garlic powder and onion powder and then grill them on the outside BBQ. Amazing flavor, hearty "main course". I would serve the mushrooms with sauteed spinach (hidden under the mushrooms), steamed carrots and marinated olives. Napa Cabbage--This will be made into a vegetable stir fry using rice noodles or rice. Basil Leaves--How can basil be the main course? We love it on everything, including salads and pasta. I use my homemade pesto as the dressing for a dinner salad. I will use a variety of the vegetables that you see and make a large salad for our family. I still have lettuce from our last trip (not pictured). If I have chicken or shrimp left over in the refrigerator I will also add this to the salad. We eat a lot of salads for dinner. 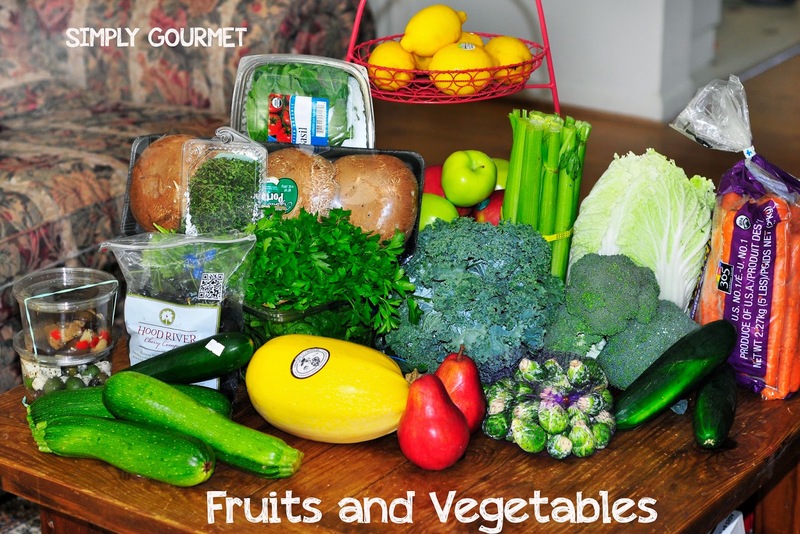 Side dishes that I will make with some of the above ingredients include: Shaved Brussels Sprout Salad, Broccoli Salad, lots of steamed carrots, sauteed zucchini dishes, and smoothies for our breakfast meals. We have one smoothie every day, including Finnley. Juice is an interesting purchase for us. My son is the only one that drinks it. No one in my family, besides him, can tolerate orange juice or most juices. He drinks one small glass every morning. I don't buy juice because of the high sugar content. We would rather drink smoothies filled with more vegetables and lots of water. My kids eat a small amount of dairy. I try to buy raw cheddar cheese for them to use. They still love "orange cheese". I buy a few blocks each month for them to have on sandwiches, nachos or quesadillas. They are kids and the color thing is a big deal. Isabella is almost broken of the, "I need orange cheese". Lunch meat is hard for us because I can't have nitrates. We buy lunch meat without nitrates and nitrites but it is expensive. I have decided to start buying whole hams and turkey breast roast and making our own. I bought a meat slicer a few months ago and this allows me to cut all of our salami's, hams and turkey. I bought the 2 pound turkey roast you see in the picture for $20.00. It saves me about $15.00 dollars to make it myself. I have been paying $16.00 per pound for lunch meat. Eggs are a huge part of our diets. We eat them daily in a variety of ways: omelets, scrambled, fried, hard boiled, and of course, for baking purposes. If I can buy them from my local friend or the Farmer's Market I will, but for this week I needed to buy them from the store. Frozen fruit is purchased once a month for our smoothies. We didn't buy meat this trip so I knew that I would be well within my budget and picked up our frozen fruit for the month. 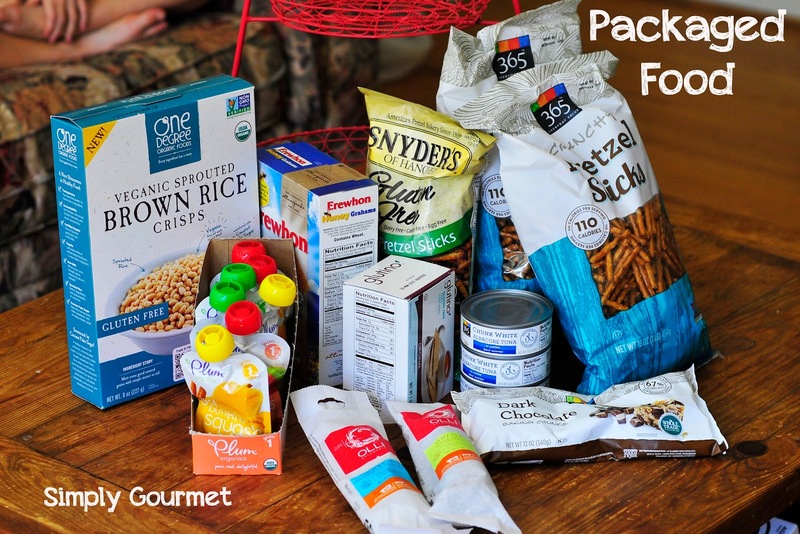 Compared to most families we do not spend a great deal of money on packaged food. I can't figure out yet how we would not spend anything. I have kids and they need lunches and they are not restricted in their diets and they want easy foods. I try to have a few things on hand that they can "snack" on. Again, my kids are not huge snackers and I believe this is because they eat meals made from scratch using fresh, whole ingredients. Finnley has been a challenge to feed when we are out and about for the day. I try to make all her baby food but for outings I do buy the Ella and Plum bags of food. They are easy and mess free. Graham crackers, gluten free pretzels and cereal are just a few of the finger "crunchy" foods that we have tried for her when she needs a snack. We tried the cereal that you see in the picture and it didn't work out too well. They don't dissolve easily in her mouth. Oh well, it was worth a shot. Our kids love pretzels and I usually buy the cases of gluten free pretzels from Amazon but on this trip I needed a few things for my big kids to take to school. I bought a few of the bags you see in the above picture. Let me know what you think. Is this a helpful update for you? What would you like to see in these post? I try not to get too specific with brands in the post, but if you have questions then leave them below and I can try to answer them. 1. Buy in bulk. I use Amazon Prime to save on shipping and for speedy delivery. (this is not a paid post.) I really do use them A LOT. 2. Allow extra money in your budget to buy items when they go on sale for future use. 3. Shop with a list. The days I go shopping without my list I usually spend more money then I had planned. 4. Shop the perimeter of the store. I know you hear this frequently but it's true. Everything in the center is packaged, canned or bagged. We try to avoid the center aisles as much as possible. 5. Eat more vegetable driven dishes. Meat is expensive, especially organic grass-fed meat. By eating less meat we have reduced our monthly food expense by about $200 dollars.